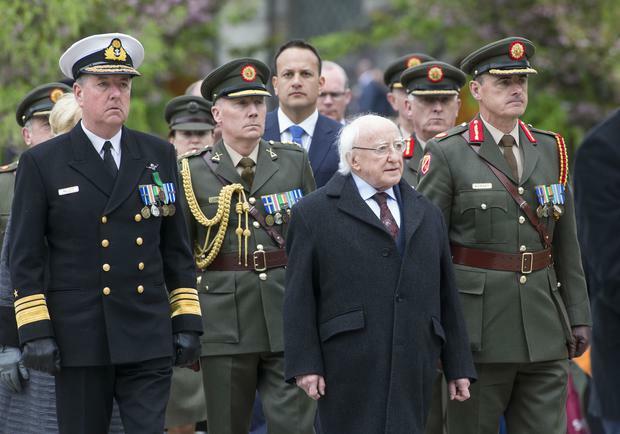 PRESIDENT Michael D Higgins today led the State's annual Arbour Hill Commemoration Ceremony, laying a wreath at the burial plot of leaders of the 1916 Rising. He was joined by representatives of religious communities, the government, the judiciary and Defence Forces members in marking the sacrifice of those who led the rebellion against British rule 102 years ago. Those in attendance included the Taoiseach Leo Varadkar, Fianna Fáil leader Micheál Martin, Sinn Féin deputy leader Michelle O'Neill and Labour Party leader Brendan Howlin. Defence Forces chief of staff, vice admiral Mark Mellett, was also present and the celebrant of the mass was the Bishop of Limerick, the Most Rev. Brendan Leahy. The Arbour Hill cemetery on Dublin's northside is the final resting place of the seven signatories of the Proclamation of the Republic including Padraig Pearse and James Connolly, as well as other executed 1916 leaders. One hundred soldiers of the 7th Infantry Battalion formed a guard of honour along the cherry blossom-lined path of the procession to the burial plot. Fr Séamus Madigan, head chaplain of the Defence Forces, led a series of prayers including some by representatives of the Church of Ireland and the Jewish and Islamic faiths among others. He said: "As we gather to remember the leaders of 1916, mindful of their sacrifice, we dedicate ourselves to working for a more just and inclusive society. "We give thanks to our loving God for the political and religious liberties and the rights that we enjoy today." The President then laid a wreath and a minute's silence was observed before the Army Number One Band played The Last Post and Amhrán na bhFiann. Others in attendance included Tánaiste Simon Coveny, ministers Paschal Donohoe, Josepha Madigan and Denis Naughten, Fianna Fáil deputy leader Dara Calleary and TD Éamon Ó Cuív, and former Sinn Féin leader Gerry Adams.